Yes it is finally peony season at the farm and it is glorious. I love this time of year in the garden. If I can, I head out with my clippers every morning and collect some new blossoms. The smell! The flounciness! (is that a word?)! The overabundance of petals. Remarkable. In a few short weeks time, I'm heading out to Detroit to tape the next season of Knit and Crochet Now. There's big news on the show. Brett Bara, the host and owner of Brooklyn Craft Company, has retired her position - she is now busy with twin baby girls! Congrats Brett! She is being replaced by Deborah Norville (of tv fame). You can read about it here. Last Saturday I taught an all day class at the stunning fuchsia walled Stitch House - a knitting and sewing store in Dorchester, MA, a neighborhood in Boston. It was my first time there and it was a fantastic day. I taught 2 classes - a morning and afternoon class. I had some awesome students who did both embroidery on knits and steeking. And Annissa Essaibi-George, the owner of Stitch House is running for Boston City Council. I'm impressed - owner of a yarn store and a politician. Can only mean good things for knitting and sewing in Boston if Annissa gets elected. Great store space -- worth a trip and incredibly lovely employees - thanks all! Visit if you can folks - you won't be disappointed. Close to the JFK Library for family trips (and yarn store visits for mamas). Tomorrow is World Wide Knit In Public Day. Check it out here. So, now for the wacky title to this post. DId you know that post titles are a big thing in the blog writing world. They say the title of your post is paramount to "opens." Crazy huh? I usually just throw my hands up in despair and write something, anything. It is sometimes all I can do to write a post. I've already talked about the Peonies. Here is another photo of some more in case the first wasn't enough. Politics - Annissa Essaibi-George was that part of the discussion. Now for the Pigeonholes. For years, I have been known as the knitter, the knitter who does color, etc. It's a good thing to be known for something and I do not take this for granted. As my friend Candi says "But Kristin - there is so much more to you. I know that but the world doesn't." Here is the thing - I do not even think of myself as "the knitter." I think of myself as a person who is..... a mom, artistic wife of a farmer and assistant to all things sheep and farm related, creative, curious, interested in textiles and all kinds of textile arts (knitting, crochet, embroidery, sewing), loves color, likes to make things using all kinds of techniques including painting, ceramics, gardening, furniture restoration, interior decorating, and more. My interests go so beyond knitting.... How's that for coming clean? But the thing is, I really do feel like the world only wants me to be the knitter. I know I have done it to myself. As a career, I fell into the world of the yarn biz and it supported me and my family for years. But as a person, I always did and made other colorful things for fun and passion. And as usually does happen, and did happen for me - knitting became a job. Not a dreadful job but a job itself. And sometimes a slog. For sixteen years, I had to come up with collections season after season. It got old to say the least. I cannot think of going back to doing that again - even though I love love love the business and all the fabulous people and knitters I have met and worked with. Once I left the corporate yarn biz, I began to look for other opportunities. I co-wrote a knitting book. (It was an easy place to start.) I tried to move beyond knitting with an embroidery book for kids. It didn't do well for the publisher. Was it my fault? No - but when your numbers don't deliver sales, it makes other publishers nervous. I wrote another book on embroidery. It did relatively okay. And then I went back to the knitting because the publisher of the embroidery book wanted me to do a knitting book. Two more books on knitting. My book - Color By Kristin - I feel was my knitted magnum opus. Once I finished that book, I felt I had nothing much more to say to the knitting world in print. Yes, I wrote another knitting book but that book was an off-shoot of a failed book proposal to write a book about sunflowers, gardening, and crafting. No publisher wanted that book because I wasn't known for gardening. But sunflowers that were knit and crocheted? That would be okay from Kristin. You all know Barbara G. Walker, right? Barbara is the author of some of the most astoundingly useful and popular knitting books in the English language. She wrote many, many knitting books. And then she disappeared from the knitting scene - for many, many years. She began writing on feminism and sacred objects. Did her knitting followers follow her? I very much doubt it. I talk about this with my friends frequently. These friends happen to be involved in knitting and the knitting business and they are about the same age as I am. We look around at all the "popular" knitters now and just marvel at the whole internet charged world of Ravelry, fiber festivals, and more. It is astounding how the knitting world has changed - how an on-line presence can morph into overnight success (although I doubt very much it was overnight success - there is always gobs of hard work to go along with it). How this whole on-line thing is changing the world of yarn and yarn stores and the typical, longtime traditional way that yarn is and has been sold for eons is astounding. I frequently joke (only half-joking) with my friends that we need to wait another twenty years until we are in. Seriously - look at Barbara Walker - she is all over the place again. Go Barbara! You definitely deserve the fan worship and accolades. I have seriously digressed.... sorry about that folks. I have always followed my passions in life and in my art. Sometimes my passions turn into books and sometimes they don't. My most recent book Crafting A Colorful Home is about all my passions rolled into one. I think it is another magnum opus book for me. I cannot think of doing another one like it because I think I said it all. One reviewer on Amazon said the following: Nice book if you like painting. (I do get a kick out of reading the different reviews.) She was probably a knitter upset that I wasn't filling a book with knitting. (You know that is my responsibility to the world to only do knitting.) Oh well. I gave up long ago trying to make all people happy. It is not possible. Where am I going with all this rambling...... Here's the thing. For the past half a year or so, I have been doing everything else but not a lot of knitting. I have been helping on our farm. I have been taking care of my family. 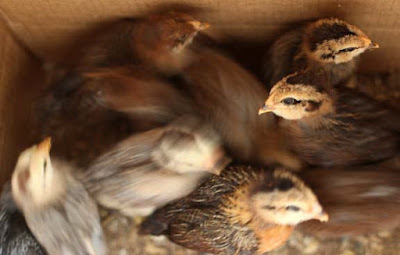 I have been cleaning my house, raising chicks, feeding animals, thinking about my garden (note - thinking - not doing). I have been teaching classes here at the farm on Fabric Printing - the reason for the cleaning (UPCOMING CLASS JULY 18/19 - STILL 3 SPACES AVAILABLE! CHECK IT OUT HERE. DON'T WANT TO DO PAYPAL - I CAN TAKE A CHECK OR CREDIT CARD. EMAIL FOR DETAILS.) I have been stitching and doing lots of crewel embroidery. I have been doing oil paintings. I have been making pottery and painting ceramics. I have been painting lampshades. There are some exciting things coming down the pike here at the farm. I do not know where they will all lead. It will be fun to see. Will they turn into anything? I don't know. I am reacting to things as they happen. Do I have a grand plan? Yes, in my head I do but I do not tell anyone about it for fear it will not happen. But.... I will begin today here today. What a lot of reading you had to do to get here...... I want to introduce you all to my new Etsy Shop called Colorful Pottery. Hop on over and check it out. Here is what my pottery looks like. Will it be a success? Who knows. Time will tell. b) that you all read it. I think it is one of the most remarkable things about the internet - that I can write what I want, no one edits me and tells me I am all wrong, and that I reach all the way around the world. Amazing. Thank you all for reading! Just leave a comment in the comments section. Any kind of comment relating to today's post. Contest is over - but I will still enjoy your comments. The winner was Annie and I have notified her by email. Contest ends Sunday evening June 14th at 11:59 p.m.
As always, please leave an easy way to get a hold of you - email, blogger id, FB name, or RAV id. P.S. A blogger id is only good if you have a way to get a hold of you on Blogger - like an email or an actual blog. If you have no i.d. on your account, I won't be able to contact you. Thank you for sharing your talent, experiences and what led you to knitting Kristin. I'm betting there are many of us out here who can relate to at least a portion of your journey. Keep posting here and on Facebook! Love seeing what you are working on, pics from the farm and your latest color palette. Cheers! Thanks for writing this post! I do think there is an emphasis on being able to brand someone, to figure out what one thing she does and then promote the heck out of it. Nobody's just one thing, and I love seeing all the different things you do, even though I found you because I'm a knitter. Congrats on your etsy store! While I'm happy to be entered into the giveaway and appreciate your discussion of serving several masters (or mistresses) in your creative life, I actually am curious about something you mention way up top. My boyfriend lives in Detroit (I do not), and so I've gotten to know it a bit in the last year, which was a totally unexpected development. I'm curious, what brings Knit and Crochet Now to Detroit? Is it just the studio/distributor/production team that's there, or is there a knitting and crocheting empire based out of Detroit about which I am clearly clueless? There are several brands coming out of Detroit now that are more at the boutique price point (I'm thinking of Shinola), but I'm always interested in learning about companies that have been there for a long time and have stayed through recent ups and downs. Maggie B - It is Detroit PBS that brings the show to Detroit. They have been producing it for 10 seasons. I'm not exactly sure about how they got involved but someone from the knitting world met them and that is why. I am not aware of any of the yarn brands in Detroit and only fly in and out and never get to see a thing sadly. This is just me, but I have never thought of you as "just a knitter" or even "a knitter." To me, you are a designer, one with a particular aesthetic that is not exactly my own, but that is always interesting and thought-provoking. To do the things you do, I'd have to be a different person altogether. But it's all so fun, and you love it so much, I love it too! And now I'm going to go take a look at that pottery. A. I think I am one of your earliest visitors to your blog. C. I also see you as a very accomplished textile designer, outsider artist, mom, and an inventive artist. D. I often wonder about this new group of knitters/designers.A lot of this is new to them because their moms were working so this field is like the cool, outsider kid. We as adults see it more as nostalgia. We know where designs, and inspiration is derived. We actually lived in the 60.70s. 80s. and 90! E. Reinvention. That is what we are all doing, constantly to maintain not only how we live, where we live, but emotionally live. I used to be a graphic designer, now I am a production coordinator with an emphasis in digital asset management. I live in the country, not a city girl anymore, and I have a good life. f. I hope to take your fabric printing class next year. I was going to sign up this year, but remembered that my sister is coming up and we all need to visit one another. It isn't often these days we can do that. Take care and I look forward to your future explorations. I think the best crafters/artists are those who are multidimensional. I, too, am known primarily for my knitting even though I quilt, embroider, even tat! I also think those who embrace gardening, beauty, color, and nature have more of a palette from which to create their art. We are not alone, and hopefully the world of creativity will turn and embrace us before too long. I will continue to check in and see how things are on your farm. I love the pottery (one art form I have always wanted to do but haven't yet) so I will be sure to frequent your Etsy shop. Good luck! I'm a fellow farmer (goats, pigs, ducks - not sheep like you), and a fellow knitter. I can soooo relate what you are saying, people pigeonholeing you into one category... I teach cheese making classes and am launching an online cheese making class, and people are surprised and say, "I thought you were a knitter!" I am a thousand things, thank you very much! Glad that you shared this post. It's so wonderful to know that there are other super creative people out there, loving the earth, loving color and loving teaching! It is such a joy to read your posts. And today to share peony photos! Kristin, congrats on your 1700+ posts! I was sorry not to be able to attend your classes at Stitch House. It is a great shop. And I am one of the many Boston knitters who is supporting Annissa for City Council this fall. Hope to meet you in person sometime soon! Peonies are my favorite flowers. If I had planned better, I would have chosen something with a longer blooming period. If I am signed in with my google account, do I still need to include an email address? Just in case, it's ferguson dot ar at gmail.com. I first got to "know" you through knitting. When I bought Color by Kristen, I didn't realize that I already had some of your patterns, saved from magazines, or in other knitting books. What really got my attention and keeps me coming back for more is your unabashed use of vibrant color, in a time when monochrome seems to rule. Have you seen HGTV? Best of luck on your new Etsy shop. I'll "favorite" it. I love your pottery! The amazing thing about you is that there is so much talent! Everything you touch is beautiful. Knitters are lucky to have your inspiration. So are people who sew, embroider, do pottery. garden etc., etc. Some people have a lot of talent but no organization. You manage to do it all - while taking care of your family (and farm). Maybe another great magnum opus about "time management" to reveal how you do it all! Very thought provoking post today. I LOVE that you are so versatile and not just "the knitter"! Gorgeous pottery! Kristin, you are a kindred "CRAFTER"! - Someone who can take whatever raw materials and transform it into "useful" *ART*! I pity the People who "pigeon-hole" you as being *just* THIS or THAT, as those who do, are pretty much "creatively" CLOSED-minded! - It's like saying that DaVinci was JUST a "PAINTER"! You are multi-craftual, Kristin. It's a shame "some people" want to pigeon-hole you, but you're too smart and too strong to let yourself limited that way. As long as you're happy with what you do and stay curious about new things and new ways of doing "old things" you'll continue to remain popular. May you have blessings and success in all your ventures. Thank you for this post! I discovered you recently, and have Crafting a Colorful Home as my current 'look through to dream and plan' inspiration book. I think following your heart and flowing with the seasons of your life keeps your artistry fresh. There are too many authors out there who become stale by repeating a formula that worked for the last book rather than following their muse. You are multi-talented. I have always loved your pictures. Good luck with the pottery, it's so pretty. Gorgeous pottery!!! It's definitely reflective of your wonderful color sense. Kristin, I think that you've shared all sorts of intriguing, informative and valuable information in this post about our dedication to art and craft that we love continues to face up to the seasonal, changing whims of commercial trends. All too strange, and perhaps a bit sad. And yet, every day I imagine that some young person is being taught how to cast on some knitting stitches on a needle and then...presto chango...turn those loops on the needle into a knit or purl row...and he or she is off into the wonders of the knitting experience. Just for the record, I may be one of your biggest fans!! I have watched you on Knit and Crochet (Today) Now. Congrats to Bret on the birth of twins. It will be interesting to see Deborah Norvile as host. I know that both she and Vanna White are knitters. I have a special interested in your colorful style of EVERYTHING! I have been inspired from watching you to try my hand at different knitting projects like 2 color patterned knits. 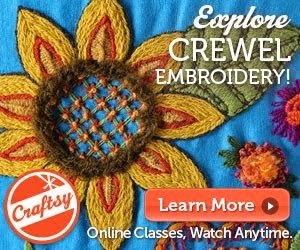 I'm now hooked on crewel embroidery after purchasing your Circle Pillow Kit. Mine will be turned into a bag to hold future projects. I'm looking forward to taking your embroidery class in August and love your books and your pottery endeavors. I plan to add some of your colorful plates to my otherwise boring white set. I always enjoy reading your blog! I particularly like the sheep pictures! I have taken your embroidery on knitting classes and am still assessing my options! My feather stitch continues to look like sutures...and, no, I am not a doctor! Best of luck with the new Etsy shop! You pottery is gorgeous! Wow, what lovely pottery, Kristin!! Thank you for offering a giveaway! It's so thrilling to see your personal color palette and style aesthetic in all your work, whether that's knitting, embroidery, painting or pottery. It's so coherent. I have always loved your various talents. While I came to know you when I became a knitter in 2006, I love reading your blog because it is so varied. I love the flowers, sheep, the fact you are willing to talk about the hard realities of farming (so much starry eyed writing out there on the agricultural life). So thanks for being willing not to be pigeon holed as a person and a creative. I checked out your last book from the library, it is really cool. I have Color by Kristen and it is just much fun to look at. So keeping on being yourself. Love the new Etsy endeavor. I have no memory of how I found your blog, but it was most likely through a link from the Yarn Harlot years ago. I didn't know you as "The Kristin Who Is a Knitter," and I really enjoy how you apply your artistry in so many areas. I'm an American living in New Zealand and have recently found a friend here who has also been following your blog for years; I would guess there are a number of us down here who read you! Your pottery is amazing! I love the colors. They set a happy table. I am pudgypooh on ravelry. How exciting and scary to let everyone know that you are not just a knitter!!! I am a mom, teacher, librarian, knitter,reader and one day . . . who knows??? maybe a writer and illustrator???? I do know that I could not be an effective librarian if I weren't a teacher, mom, reader and knitter first! I can't wait to hear about all of the exciting news from the farm. I find your creativity inspiring in whatever form it takes- knitting, embroidery, painting, what have you. I look forward to whatever endeavors you tackle next. Checking your blog for new posts is something I do everyday because your multi-faceted talents are so exciting and inspiring. As a California city girl, I especially love learning about your farm life and how you embrace the changing seasons. Your pottery line is gorgeous and I hope that you will have great success. Thank you for your generous offer. I do know a few of your other hats- I identify you as a creative supportive and driven woman with a family... and I guess not enough hours in a day to complete the standard " must do" list and the motivating "must do list". Interesting how we all get pigeon holed- a reminder to keep my view broad. Thank you for all the facets of your shared creativity and inspiration- it pumps up my creative soul. I enjoy reading your blogs! You indeed have a very full and interesting life.I think it is great that you are always moving into new things and now pottery.I shall hop on over to your Etsy shop and take a look. Blessings on your new endeavor! I have read your blog for years, finding it because knitting is one of my many hobbies as well. I don't always find projects I'm going to go to pick up and do like you, but love to read it for inspiration. I especially love your real stories of life on the farm. I have always thought of you as a " happy color person". I guess that is not a label that high school guidance counselors have on a checklist of great paying jobs......but it should be! I am trying to follow the advice of a person from my past -- do what makes your heart happy. As I create happy critters and such from upcycled sweaters I love seeing the smiles on the customers who stop to hug, laugh, or purchase. colors...like your happy colors all mixed together make my heart happy and help to spread that joy to others! Love the pottery Miz happy color lady! Can't wait to see more pottery! Thanks for sharing so much of your full self and life with us. I found you and your blog in 2008. You became part of my expanding knitting world. You live the idea of embracing change and creativity and hard work. you are inspirational! Thank you. Here is another great source for sunflower seeds - Pinetree Garden Seeds www.superseeds.com. I do not work for them. Just a loyal customer. Nanfleur on Ravelry and ncpinn on gmail. While I LOVED your knitting books, I know that your talents are not confined to only wool and needles. You are an ARTIST and must go where it takes you. Follow your bliss! I love your knitting, but I enjoy more seeing how your creativity blossoms in so many areas of your life. This weekend I will knit, sew, sketch, paint, garden... I can't stick to just one pursuit because my enjoyment bubbles over into so many areas. Your pottery is beautiful! Thanks for being an inspiration in leading an artistic life. As a relative newcomer to your blog, I identify you with color, particularly bright and cheerful color. I was drawn in by your work in embroidery but am excited about the colorful pottery. Keep on coloring our world! I thank you for your inspiration and many talents all these years. I love that you continue to stretch yourself beyond people's expectations of you. Keep shining your light, girlfriend. Can't wait to see you in Detroit. Hi Kristen! I truly enjoy reading your blog and enjoy your wonderful photos of all the things! You are a very talented person and it's wonderful that you enjoy so many different types of crafts! Your sense of color is so inspiring! I'd love to win your fabulous giveaway and have favorited your Etsy shop to watch for future products or to purchase current ones. Thanks for the chance ! It's funny, I think of you as a designer who uses a varied toolbox of skills to convey your designs and colors. Even when your blog was about knitting, the photos of your home, garden and of your life on the farm were so well staged, anyone looking would realize your multidimensionalality, is that a word? Keep it up Kristen, the world will catch up! Well, darn. I just wrote this long heart-felt comment about how I love the entirety of your life and how it's inspiring to me, but the comment seems to have disappeared into the digital ether, no doubt consumed by required Google sign-ins and the like. Annoying. Anyhow, I don't need to win anything - I have a lot of your varied output! - but I do wonder if you'd consider holding a once-a-month class on pushing one's creativity boundaries, in all media. I live close enough I could easily get there once a month, and I bet there are five or six others nearby who would do the same. Think about it! I love love love color yarn, pottery what ever. I want your life! I love your knitting AND your pottery AND your embroidery AND your farm! I have your latest book and some of your knitting books. To me they are coffee table books. Full of beautiful pictures and color. I sometimes just sit with a cup of coffee and look through them and enjoy the beauty. Your peonies are gorgeous as are your sunflowers. I am sorry to say that I'm a newcomer to reading blogs so I've only been reading yours for a few months. (I know, I know, welcome to the modern world!) And while I found your blog through a knitting link, what kept me coming back was your diversity of activity and thought. That's what makes you interesting, and that's what makes me glad that I've finally found your site. I am a new reader to your blog. I saw you at the web's tent sale. I enjoyed your latest book. My favorite pictures are of your work room floor. All floors should be like that floor. Love it! Your new venture into pottery is awesome. I was introduced to your blog while @ a knitting class. A woman was telling all about this very interesting woman who is so multi talented. I've been reading ever since! Color by Kristen is still my favorite. I'm a farm born woman who loves hearing about your husband & the trials of farming. I've watched your daughter grow up to be a lovely young woman. I'll be a fan of your new venture too! Love the peonies! I love your peonies. We have some and love them also. Thank you for everything you do. You are amazing. I love your book on the colorful home. I am painting some canvass to make hammock chairs for my grandsons now, based on your instructions. Then, I will tackle some of the other projects in the book. I am sorry you feel so pigeonholed. Crafty people, in my experience, are crafty in all sorts of ways. So, I sewed a backpack for one of my grandkids, will be painting the hanging chairs, and have been experimenting with a zebra cake for my son's girlfriend's birthday, while worrying about (and doing a bit of weeding of) the vegetable garden, and planning knitted red scarves for a fall charity project. This seems normal to me. And, your work is gorgeous! I love the pottery colors--so bright and cheerful! Whoa Kristin! You have many admirers who understand creative multi-dimensionality! As a farm based 73-year-old widow I have a multitude of outdoor tasks demanding attention but my various creative outlets are my true sustenance, without which I would be drought stricken. I see you as a creative person who loves color in all mediums - paint, fiber, flowers, etc. Continue to go where your spirit leads you and we will follow. Thanks as always for your generous give-aways. Kristin, I've enjoyed your blog for years. I own all your books and have always considered you an artist. I can't wait to check out your pottery! I wish you a lot of luck with it! I think you are so much more than "just" a knitter! Love all your color! Congrats on opening your new Etsy shop. I love your sense of color and thoroughly enjoy the glimpses to life on your farm. Also I will pay more attention to blog titles. Your blog is great. Love your your pottery, your Color At Home book & knittng. Look forward to your blog posts. I will be here to support you as long as you are playing with color in any format. I share your pleasure in many types of activities, enjoying variety. You are an inspiration & just wish you lived closer. I am definitely a knitter, but I sew, weave a bit, cross stitch, bake, and generally follow my creative inspiration. That's one of the reason's I've always felt drawn to your work and your writing. So many lovely ideas to tumble around in my brain. I agree that labeling or branding can be an obstacle, especially now with all the emphasis on branding. As a teacher, knitter, and woman, I think we are lucky to be more free to try whatever we like and I long ago gave up worrying about my wide and varied interests, but of course, I don't make a living from any of my crafts/hobbies as you do, so I'm sure it's completely different. Love your pottery, as I love all of your crafts. Do what you love, as they say, and you will have supporters and detractors, always. I'm a supporter, in spirit, if not much else! Kristin, I have so enjoyed your work ever since I happened upon your first knitting book. Reading your blog is like sitting down with a good friend and hearing her daily life story. Thank you for sharing so much with us all. Your pottery is something new for me to truly appreciate about you and enjoy! You're right on the money!!!! I'm more than knitting even with my 43 pair of my hand-knit sox in my sock drawers. I'm more than a quilter even when I've made numerous quilts. Early this Spring I picked pens & paper and began drawing/sketching. Loving every moment of the adventure. Your 'Crafting a Colorful Home' is always within reach for a quick, refreshing look into more inspiration. Life is full of chapters, some close, some overlap and of course some start, so if knitting is not part of your life right now, that is okay. It doesn't mean it never will be. And of course, it is your choice. Do what makes you happy! Thank you for sharing your talents with us! Enjoy! Sent this on to my daughter. She loves peonies and hers did not bloom this year for some unknown reason. Kristin, I am constantly amazed at your use of color and your creativity! It is what drew me to your work, whether it be your patterns, stitches, books or the walls in your home :-) Your new pottery is just amazing! Looking forward to acquiring a few pieces ~ From one sunflower lover to another, Thank you! I've been reading your blog for several years now, Kristin, and I certainly don't think of you only as a knitter. You have so many artistic and other interests and it's lots of fun to follow along as you try out new things. All the best with the pottery and other ventures coming! God help the person who has but one interest. For me, having only one interest is another way of describing being in a rut. I thoroughly enjoy reading about your various interests and how you have pursued them. Frankly, I think the variety is why you have had 'lasting power'. You are constantly renewing yourself by pursuing your creative interests and color in a variety of disciplines. And, when you do this, you turn a switch on in your reader's imagination. No one discipline stands totally on its own. They support one another. Before I read this post, I decided to purchase the pieces which I had caught my fancy. I had been mulling which ones to get. I pared down to two and now am anxious to see and handle them in person. I am so glad you are making this available! I don't comment often enough, Kristin, but I read your blog all the time. Thanks so much for all your inspiration and straight talk over the years. In my former life as a school librarian, I made sure we had several of your books in our collection - and I often put them out on display to make sure they were available and borrowed! Carry on - please! Good luck on. Your new endeavors . Kristin, thank you of what you said about the knitting world today. I think it's gone nuts. Used to be everyone knitted; now, I don't know what to say. You're living the life I would have had if I had the courage to trust myself and what I wanted. Brava to you, and I LOVE your book "Crafting A Colorful Home". My ravelry ID is awindyday. I have always enjoyed all of your posts even though I rarely comment. I am someone who must have a pattern while crocheting or knitting (I mostly crochet) so I greatly appreciate your creative skills and your ways with color. I also think your pottery is beautiful and I wish you great success in your new endeavors. I say ignore the advice to title your posts a certain way, brand yourself or otherwise stop yourself from following your own artistic inclinations. You have a wonderful sense of color and I see that as joining together all your endeavors. And that's why your blog never gets considered for elimination during my occasional weed out of my blog feed. It's original and it's you. Those blogs that follow that advice? I can often tell when I'm reading them and stop following them. So many topics today. I love the peonies and miss them so much as they're not grown in southern CA. Your pottery is so bright and cheerful.. I'll check it out. Maybe I'd be happy with a smaller portion on such happy china. Thanks for the info. on the shop in Boston and its proximity to the JFK Library. The next time I visit family in ME I want to take an excursion to Boston. It's such a fun place to visit and I love the history. 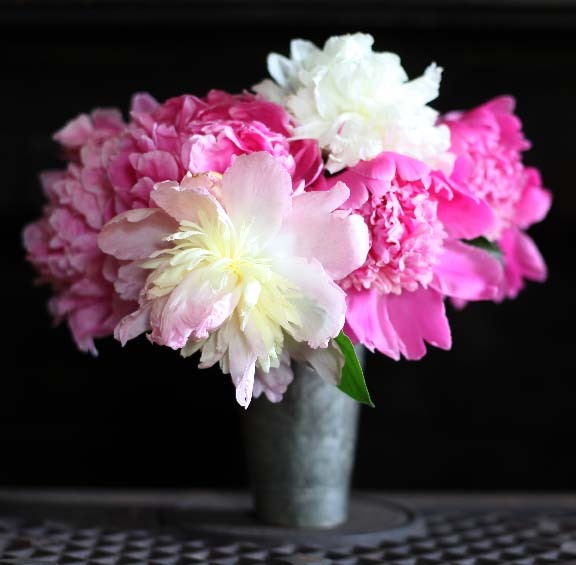 Oh how I love your peonies! The ants drive me crazy though! You are an artist. Period. And your pottery is gorgeous. I wish you the best luck in this new endeavor! "Flounciness" should be a word! I think ceramics are a natural evolution from knitting, sewing, embroidery. Just favorited the new shop! Love watching you evolve!! We are so much more then just one thing - how silly to let just one facet of our life define us forever!! Love your flowers...I have a black thumb :( Your houses and lampshades are wonderful!!! HOW NICE OF YOU TO GIVE AWAY ONE OF YOUR HANDMADE TREASURES! I HAVE YOUR LATEST BOOK AND JUST COMPLETED MY FIRST PAINTED LAMPSHADE! WOO HOO! I PLAN TO DO MORE, ESPECIALLY AN OLD ANTIQUE FLOOR LAMP IN OUR DINING ROOM. 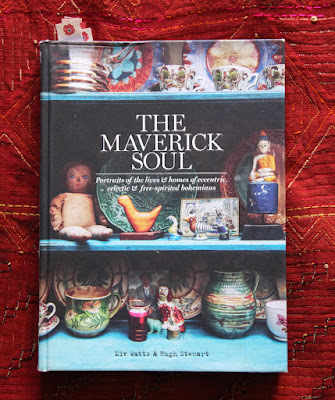 THERE ARE MANY THINGS IN THE BOOK THAT I WANT TO TRY FOR THE MAIN REASON OF ADDING MORE AND MORE COLOR TO OUR HOME, ALONG WITH ITEMS THAT ARE HANDMADE, EITHER BY MYSELF OR SOMEONE ELSE. I'M ALSO WORKING ON COMPLETING THE TORAN YOU HAVE IN THE BOOK. YOUR NEW SHOP LOOKS WONDERFUL (AND COLORFUL)! Hey there. First, off- I get a bad vibe by the "pigeon holing" thing when the school system tried to do that to our undiagnosed, special needs son, oh so many years ago! When I first saw your knitting books that used color that makes my heart sing! Overjoyed, someone out there like minded. I also rug hook using the same vibrant colors that I gravitate too... not the norm in my group. Then allowing to step into your home- so much joy. Now the pottery- keep it going... It's amazing! Thank you for such a nice giveaway. 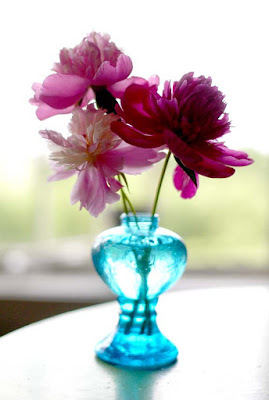 Your pottery is as beautiful as your peonies. The first time I saw your color washed walls I was a fan for life! Color makes me happy! I love your pottery. 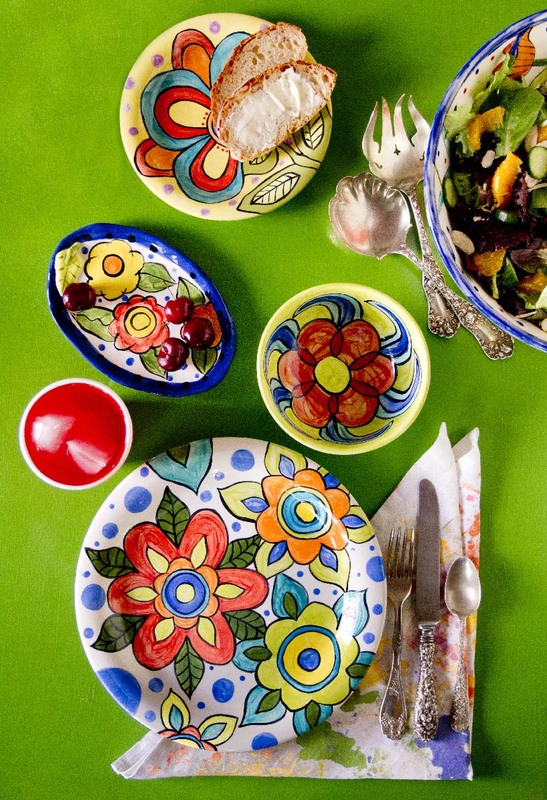 It reminds of of Mexican Talavera. I wanted you to know that I do not think of you as just a knitter, maybe because I discovered you recently. I stumbled on your Colorful Home book at my local library and I liked that there were so many different projects. Your book reinforced my I Can Do It attitude, or that it is OK to at least try, and I appreciated that. I would love a chance to win a colorful house. They are so cute, I love houses and color. Anyways, I am not a knitter, I love to embroider...taking your craftsy class slowly and loving it. I think of you as a fellow sheep lady and color lady! We live on a sheep farm and I know the work that goes into all that...so Go Kristin in all the ways you want to go!! Love to read all that goes on at your farm. Also Love all your pictures of sheep, flowers and your colorful house. Your pottery is really beautiful! Love your Etsy Shop. Have always enjoyed your knitting patterns even made a few mittens. Keep writing your blog. We love hearing from you. As always your art is amazing. So bright and colourful . Hi Kristin, I know you as the Embroidery Lady since I don't knit. Purchased your Stitching with Wool class and I love it... One sunflower done. Love all your colorful ideas. I didn't know Brett Bara was leaving K&CN. I have enjoyed her hosting the show, and wish her the best. I do know what you mean about being pigeonholed! You're so creative and smart about getting the things you love to make out there. Color by Kristen has been a favorite I return to often. There are so many things you do well, and I appreciate all even if some aren't things i do. I know it all will go well, and can't wait to see the results of your secret plan! Wishing you all the best, and hoping, hoping I get to pick something from your pottery line. then I could end up with two pieces! I love my peonies - they are on either side of my walk leading up to my front door and when I open the windows in the front of my house the fragrance wafts in. I only wish their blossoms lasted longer. Thank you so much for writing your blog and for NOT being just a knitter. I first "met" you as a knitter - I own most of your knitting books and many of your patterns. (And, they are wonderful; I love knitting your patterns.) But, I also have your embroidery books and your new book and I read your blog because I love hearing about your farm, your sheep, your garden, and all of your projects. You inspire me with your painting, your fabric printing, your birch-bark holiday houses, your flowers, your house decorating, your sewing, your ceramics(! ), your embroidery, your knitting - ALL of your projects. I think you are a very talented and wonderful woman and I hope someday to be able to meet you and take a class from you. Hi Kristen, I primarily came to your blog from another knitting blog but absolutely love seeing all the different arts you do. I am in love with your farm, would love to have coffee in your kitchen or curl up in a window seat with a good book. Everything about what you share is fabulous, reminds me of living in Charlton MA which I miss more and more. I learned to knit from bloggers and YouTube, crafting and art didn't happen much in my home growing up, so I enjoy learning about all different things. I never imagined I would enjoy gardening -don't like sweating, or dirt, or bugs much and never thought I would be very good at it much less where to begin. Your sunflowers and all the info you share helped me find my way and it so cool to see those flowers now and know I did it! Hoping to learn some sewing this summer, and have plans for some embroidery type stuff for fall and Christmas decorating swimming in my head. I wish you the best of luck with the etsy shop, and that you always get to follow your heart and do what you love. Thank you for all the inspiration, information, fabulous designs, and photographs of it all! I'm too late for the contest, but that is okay. I am lucky enough to have several pieces of your pottery from when I went to the farm sale. They are beautiful and make me smile. I hope all is going well and that your plans coalesce. I love your spirit of creativity and use of color. Hi Kristn, I hope you continue to evolve and add more workshops to schedule! I haven't been able to take one yet but plan to in the near future. I have always been a fan of your bold and free color sense. I think your home is fantastic and would love to have you as a friend! I'm late to the party but wanted to comment that I checked out your etsy shop and immediately favorited it! I will be returning to make purchases soon. Best of luck with this new venture. I have always loved your blog for the variety of creative content. I have purchased notecards, postcards, knitting patterns and books. My latest purchase being Creating a Colorful Home. I've enjoyed all of it and congratulate you on continuing your creative explorations with pottery. Keep it coming!